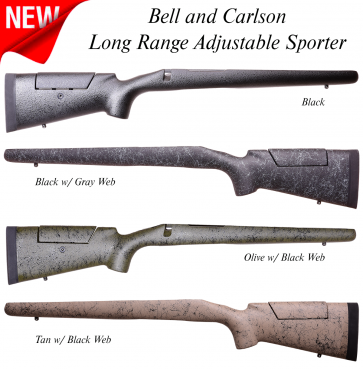 Bell & Carlson Long Range Adjustable Cheekpiece Sporterl Remington 700 Long Action - a cutting-edge aluminum bedded long range stock for sporter barreled long action Remington Model 700 hunting rifles. Stocky's take: The 2089 was designed with a purpose - to build the lightest practical aluminum-bedded sporter stock with adjustability. Construction-wise, it compares to the Alaskans with the very useful addition of an in-house designed, lightweight adjustable cheek riser. Weighing in at 2 lbs. 11 oz, it'll add significantly less weight than any other adjustable, resulting in an outstanding 8 lb hunting rifle suitable for the addition of the biggest and baddest scopes available. Opening to fit heavier barrels is not recommended due to the slimmed down forend. The stock features a full length aluminum bedding block which extends from the grip area to the forend for added strength and rigidity. Cheek Adjustment: In the fixed position, the cheek is .475 inches below the bore line. Has 1.125" total upward adjustment. 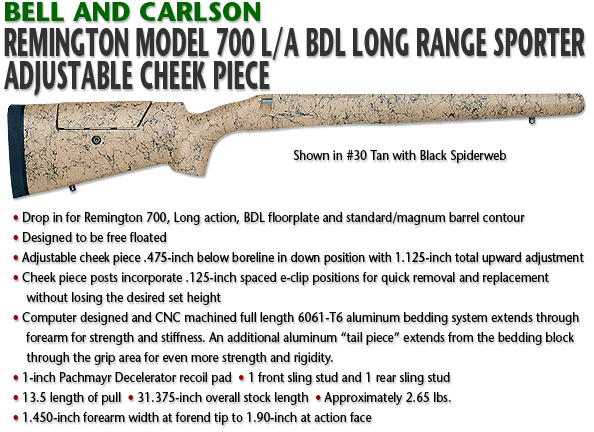 For example, my pet .280 AI (26" fluted magnum factory sporter contour) barreled action BDL is 5.25 lbs, with this stock an even 8. Adding my favorite 30mm Leupold VX-R 4-12 X 50 CDS, mounts and ammo and there'll be just over 9 lbs on my shoulder - the lightest anyone can expect from an adjustable hunting rig.